Ultimate Marvel vs. Capcom 3 is an updated version of Marvel vs. Capcom 3, and it makes me wonder what the next version is going to be called. Ultimate Marvel vs. Capcom 3.5, perhaps? 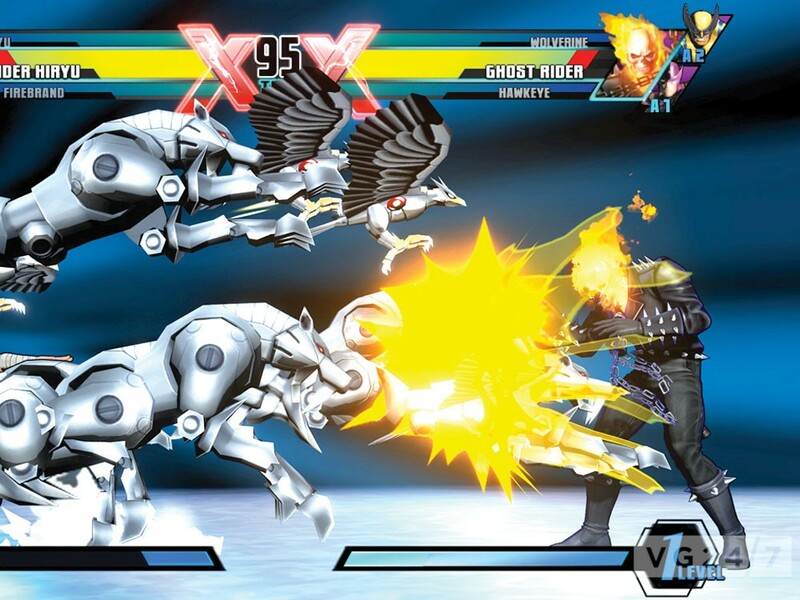 Or maybe, We’re Totally Serious, This is the REALLY Ultimate Marvel vs. Capcom 3. Xbox 360, PlayStation 3What does “ultimate” mean? For starters, it means that players can select from all 48 of the game’s characters from the beginning — no need to unlock them. Considering that most fighting games make me play the same basic fights for about a dozen hours before giving me access to the coolest characters, I’m willing to call this game “ultimate” just for saving my time. Those four-dozen fighters are drawn from some of the greatest bam-biff-pow brawlers ever imagined. From the Capcom side, there are heroes and villains from classic videogames such as Resident Evil and Street Fighter. Marvel, of course, contributes icons like The X-Men and Spider-Man. It’s the player’s job to assemble a team of three fighters with which to pummel the competition. Each character has its own way of fighting that’s just a little bit unique. Flying characters battle fully grounded fighters. Characters with unchangeable, innate superpowers must battle fighters who build and upgrade their own weapons during the course of a match. But the real variety comes into play when the characters combine forces during the game’s tag-team swap-outs, generating unique power attacks. While the basic fighting commands are easy to learn, these combos are gradually revealed over time. Playing Ultimate Marvel vs. Capcom 3 doesn’t result in new costumes or characters like most fighting games. Instead, it results in the ultimate improvement — better gameplay. THE GOOD: I don’t play videogames in order to watch movies. I play videogames in order to play games. Fighting game stories are usually the worst — they try to make the characters seem emotionally invested in each other and the various battles. This never works. But Ultimate Marvel vs. Capcom 3 has figured out how to integrate an actual story into a fighting game: Galactus — the Marvel super-villain — will destroy the world unless I’m able to reach him and defeat him in time. The timer during each match is actually a countdown to the end of the world. If I don’t win the match and reach Galactus, everyone dies! It’s a simple story with some built in pressure, and no need to endure a movie. THE BAD: Capcom, the publisher of Ultimate Marvel vs. Capcom 3, is also the publisher of Marvel vs. Capcom 3 that was released nine months earlier. Players who already paid $60 for the original game will wonder whether the new game’s $40 price tag is worth the additions. The answer is: not really. As much as I like Ultimate Marvel vs. Capcom 3, I liked the un-ultimate version too. It had a lot of the same strengths as the updated version, and only lacked a few extra characters and some under-the-hood tune-ups. Those changes might be worth a $10 download, but I don’t think a $40 re-purchase is warranted.